Krakow region tour, 2018 - 2019 tours to Poland - discover exciting Poland with us! Arrival in Cracow, transfer to a hotel. Depending on your arrival time, time to relax or your evening stroll through the Old Town, dinner on your own. An overnight stay at a hotel. Breakfast, guided tour of Cracow: the Main Market Square, St. Marys Basilica and historical trade pavilions of the Cloth Hall, the Royal Route, Collegium Maius, Wawel Hill with its renaissance Royal Castle and Cathedral; a walk round the Old Jewish Quarter - Kazimierz. Kazimierz is also a place especially cherished by lovers of antiques. Dinner in a regional restaurant with live folk music, overnight stay at a hotel. Breakfast, transfer to Wieliczka - a visit to the famous Royal Salt Mine with numerous underground chambers, chapels and salt sculptures. Next, visit to an Auschwitz - Birkenau State Museum in Oświęcim, the biggest Nazi concentration camp from the II World War. Dinner and an overnight stay at your hotel in Krakow. Breakfast, and departure to Zakopane. Next guided half-day tour of Tatra mountains and Zakopane region. Your tour includes the wooden church at Jaszczurowka, sightseeing tour of the town including funicular ride up Gubalowka mountain, from where you can admire a full panorama of the Tatra mountains, followed by a visit to the market and the Museum of the Tatras. Afternoon time for relaxation. Dinner in a regional restaurant with live folk music, overnight stay at a hotel in Zakopane. Breakfast, departure to Pieniny moutains and a raft cruise on the Dunajec river. Your visit to the castle in Nidzica – one of the most famous in the Pieniny mountains. Return drive to Zakopane for a dinner and an overnight stay at a hotel. Breakfast, depending on your return flight hike to Morskie Oko – a beautiful lake surrounded by the highest peaks of the Polish Tatra mountains or walk along the Kościeliska valley with possible visit to Mrozna cave, or direct transfer to the Cracow airport and departure. Tour dates: any date between 1st of April and 1st of November 2019, available to set on your request. Cracow- an ancient magic city. Cracow offers a wide spectrum of museums, art galleries full of exhibitions, theatres, historic cellars, clubs, cafes & restaurants with live music, is an exciting destination for the travelers on the world map! The city’s cultural heritage is mirrored in its intellectual achievements – the Jagiellonian University is the oldest in Poland. The student population of the city numbers almost 100,000 and this large student population fires a lively nightlife scene that burns brightly in the atmospheric cellar bars away from the tourists above. Cracow has sharply contrasting seasons with cold, snowy winters and fresh springs and autumns. Visitors should beware of the locals’ use of the word fresh – an optimistic reference to blatantly cold weather. The labyrinthine cellars of the Old Town are an ideal place to escape the winter chill. However, come summer, the quintessential Cracow experience is relaxing in a pavement café on the main square enjoying one of the long and balmy nights. Cracow (Krakow) is now well established as a major tourist destination. At the height of summer, Poland’s fourth largest city throngs with tour groups, all manner of tourist tack and countless pavement cafés that seem to occupy every cobble of the main square. Out of season, late at night or even in the first slivers of morning light, it is clear why so many people flock to visit. This magical city, situated in the southeast of the country, between the Jura uplands and the Tatra Mountains, on the banks of the Wisla (Vistula) River, has one of the best-preserved medieval city centres in Europe. Dozens of churches cover almost every architectural period and are surrounded by monasteries and abbeys – walking through the Old Town streets is like drifting back through the musty pages of a historical novel. Cracow, Poland's former royal capital, is one of the most attractive spots on the tourist map of Europe. This is a place where legends, history and modernity intertwine. The city, which lies on the banks of the Vistula River, is famous for its priceless historical monuments of culture and art. This deposit of rock salt in Wieliczka-Bochnia has been mined since the 13th century. Spread over nine levels, it has 300 km of galleries with works of art, altars, and statues sculpted in the salt, making a fascinating pilgrimage into the past of a major industrial undertaking. our first choice! the capital of Polish Tatras. From here, you can reach virtually every single mountain nook in Tatras. Starting your day with a thrilling climb, continuing emotions in a great theatre, ending in one of Zakopane's numerous bars and pubs, your stay here will certainly be remembered. 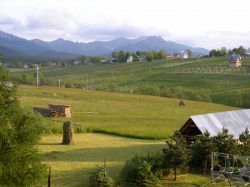 Tourists will find many attractions in Zakopane, starting with walks through the picturesque mountain valleys, wild terrain bicycle rides and horse rides and line railway rides to Kasprowy Wierch, Gubałówka and Butorowy Wierch. In winter the enthusiasts of white madness come to Zakopane to ski down the professionally prepared routes. On the lighted, evened-out with ratracks slopes of Nosal, Gubałówka and Polana Szymoszkowa you can see people skiing till late evening, sometimes even night hours. Krupówki, the cult walking place of Zakopane, is crowded all day and evening long. You can rest from the bustle of everyday life and regain your vigour here. A highlanders’ raft is made of five wooden dugouts joined together. This is how tourists travel down the rapids of the Dunajec River, admiring the most picturesque sights of the Pieniny Mountains. Every now and then the river traverses sections of breathtaking beauty. The lime peaks looming overhead soar up to 300 metres. The Dunajec meanders and it often becomes difficult to follow the direction of the watercourse. Fortunately, the highlander helmsmen know how to manage their fragile rafts, taking them safely to the final destination. The landing stage is reached after three hours of a great, unforgettable adventure.